Despite growing interest in sustainable office buildings and technological advancements, often either comfort or energy is sacrificed at the expense of the other in the conventional approach. Designers and architects tend to lean towards fully glazed buildings in a multi-floor office building due to its light structure, transparency and more access to daylight compared to traditional buildings. However, their energy efficiency and impact on occupant comfort – thermal, glare and visual – are questioned. Wellness and energy savings are not contradictory aspects of design. To create exceptional, healthy environments considerations regarding passive strategies at the early stages are relevant. To help drive first decisions, an accurate and fast simulation tool that considers dynamic thermal, daylight and airflow models is required. However, some passive measures such as natural ventilation are more difficult to simulate and validate due to the complex, non-linear relationship between wind forces and thermal buoyancy. 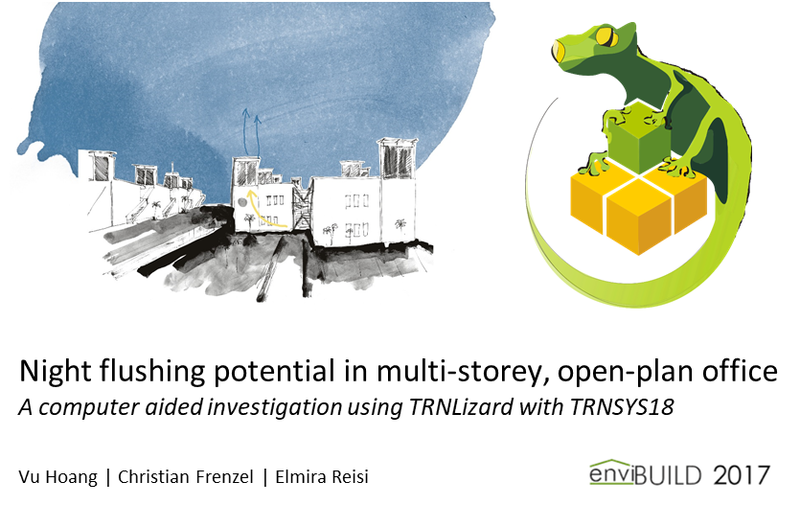 At the enviBUILD at the TU Vienna Vu Hoang will present how TRNLizard, an integrated thermal, daylight and airflow simulation tool based on Rhinoceros 5, Grasshopper, TRNSYS18, DaySIM and TRNFlow can be used to develop and validate the concept for an energy efficient office building with a healthy, comfortable environment. The office building is located in Germany with a highly glazed façade and night ventilation for passive cooling. It is shown that night flushing reduces annual end-use cooling energy and peak cooling load of mechanical air conditioning systems by 55% and 15%, respectively.